Testosterone levels peak around 30 minutes post-exercise and return to baseline by the one-hour mark. Now, will that temporary boost in testosterone from a high intensity workout result in significant muscle growth? That’s the big question. But let’s shoot at this target from a different angle. If I outlined two resistance-training programs, one that produced a 15% increase in testosterone post-exercise and another that resulted in a 100% increase, you’d likely choose the one that gave your natural T levels a bigger boost, even if the boost was short lived. The fact is, men who lift weights have higher resting levels of testosterone than men who don’t push iron. Whether that increase comes from a cascade of hormonal events due to the temporary boost of testosterone post-exercise, or other physiological processes, is unclear. Even though scientists currently don’t agree on how much of a difference that temporary boost will make, it makes sense that higher levels of testosterone can only help, so why not train in a way that has the most significant effect on boosting T? From the science side of things, E. Todd Schroeder, Ph.D., is one of the world’s foremost authorities on the relationship between resistance training and testosterone. For over a decade, Dr. Schroeder has used his exercise physiology lab at the University of Southern California to analyze and measure changes in testosterone during and after resistance training. You need to stress your body to get the biggest testosterone surge. This is why you hear reputable strength coaches emphasize the importance of working hard while training. There’s a time and place for training with lower levels of intensity, but when it comes to boosting the almighty T, go hard or don’t go at all. I’ve experimented with this type of training over the last six months… and it’s exhausting! This training is only for the dedicated folks that are willing to put in the work to kick up testosterone as high as possible. Choose three multi-joint exercises. Any combination of an upper body pull, upper body push, and a lower body compound exercise will work. Choosing four exercises, however, results in a workout that’s too long. An intense 20-30 minutes of training is all that’s required to escalate your T.
Rest one minute between sets of an exercise. Rest five minutes between exercises. You’ll perform six straight sets of one exercise with 60 seconds of rest between each set. At the end of the sixth set you’ll be very fatigued, so rest five full minutes to give your central nervous system (CNS) some relief before you move to the next exercise. The first set starts with a load you can lift 8-9 times. The trickiest part of this style of training is getting the loads dialed in. The sweet spot seems to be a load that’s as close to a 9RM as possible. From there, do your damnedest to get at least 6 reps per set. (If you get 8-9 reps on the next five sets, you either started too light or you’re resting longer than one minute.) Once you drop to 5 reps, decrease the load and continue until all six sets are finished. Do your best to avoid missing a rep. 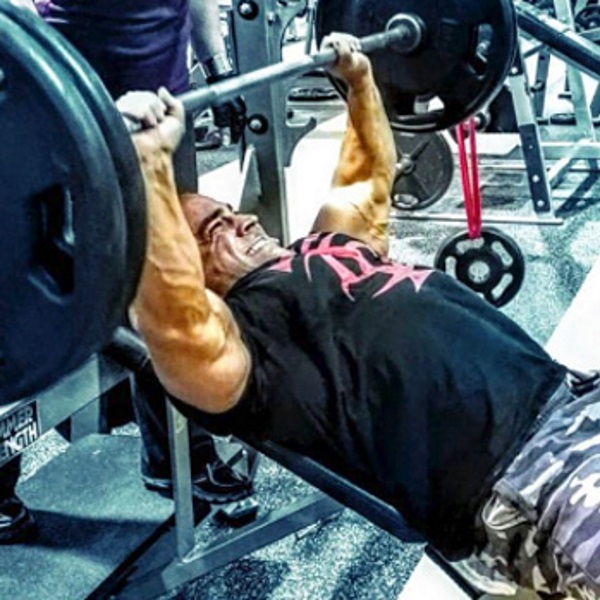 If your fifth rep was brutal, don’t try for a sixth because it’ll take too much out of you. The intensity must be high but manageable. Use different exercises in each workout throughout the week. This is an essential part of keeping your recovery in check. If you use the same three exercises for all three workouts during the week, you’ll be burnt out by week 2. Use the above training principles to create a training plan that consists of the exercises you prefer (since there are countless options that will work here). With that in mind, here’s a sample routine that will build new muscle mass over your entire body. Stay on this program until results stop or you lose your motivation. If either of those things happens, it’s time to move on or take a hard look at getting your nutrition, stress, and sleep dialed in. Due to the intensity of this type of training, workout supplementation, such as Plazma™ or Surge®, is a must. If you’re wondering what you can add to this program, it’s hard to answer because it depends on your recovery. However, if you need to add more muscle to, say, your calves, you could definitely add a calf-training program in the mix. You could also throw in 100 light side raises at the end of each workout to add more muscle mass to your lateral deltoids. Beyond those two body parts, this plan will build everything else you need. Smith Or Free Weight For Shoulders?